LAKE PLACID — It was a big day of celebrating Nordic skiing in August on Wednesday at the Olympic Ski Jump Complex with a little freestyle fun thrown in to boot. Some of the best under-16 cross-country skiers in the United States were part of the event, which was highlighted by the appearance of two world class athletes — Norwegian Nordic sprint world record holder Ludvig Soegren Jensen and American Andy Newell, a four-time Olympian in cross-country skiing. 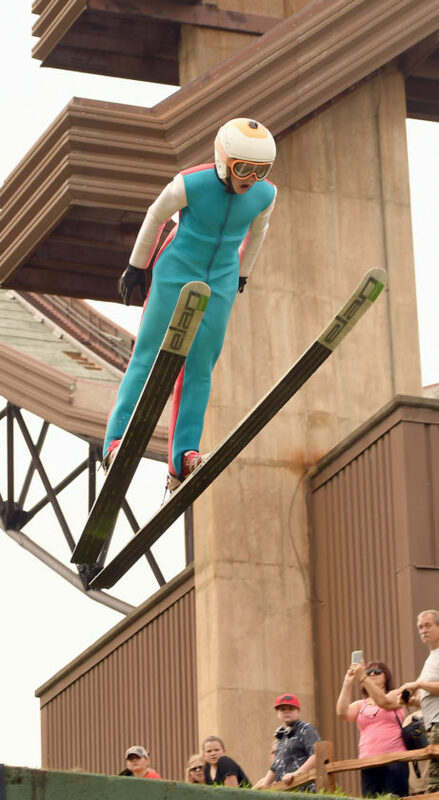 Until this summer, the ski jumps have hosted numerous Wet and Wild Wednesdays and Soaring Saturdays over the past several years, which treated the public to aerials and ski jumping exhibitions. In a way, the well-attended event marked a return of both, with a whole lot more action tossed in. The U.S. Ski team has been hosting a week-long training camp for more than 60 of American’s top young Nordic athletes, and they were part of the action as they roller skied their way over an obstacle course set up in the parking lot at the base of the jumps. 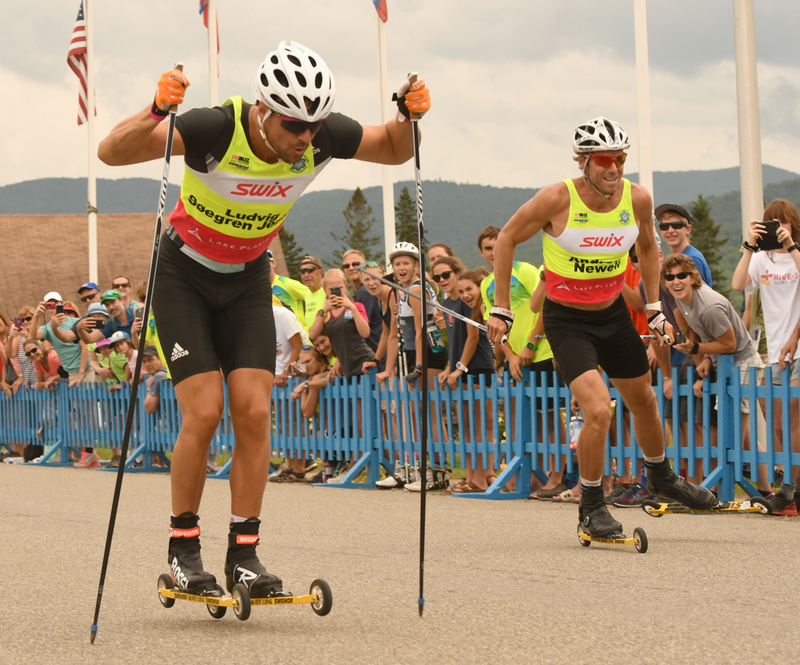 Newell and Jensen also took on the course, and after that, the contingent of fans and skiers made their way over to the North Elba Show Grounds to engage in head-to-head sprint races on a 100-meter run. Newell is a 34-year-old who retired from the U.S. Ski Team following the Pyeongchang Winter Olympics. 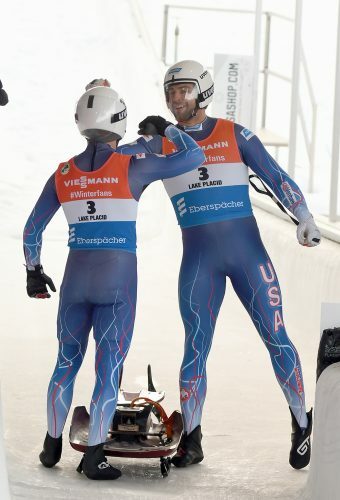 Although the Vermont native was able to beat Jensen on the obstacle course, which was a combination of rollers, jumps and traffic-cone slaloms, he was no match for the Norwegian in the 100-meter race. When it comes to sprinting on skis, Jensen is the fastest on the planet at 100 meters, and showed that he is pretty darn fast at the same distance while roller skiing on the black top. In two head-to-head races, Jensen topped Newell in front of dozens of entertained fans. “I knew I could beat him in the agility test but I didn’t have a chance out here,” Newell said after the sprint races. “He’s so fast. He’s the fastest skier in the world at 100 meters. I tried to have a fast tempo, tried to use a lot of power and it’s cool to see his technique. I’m hoping he’s going to teach me some things before he goes back to Norway. 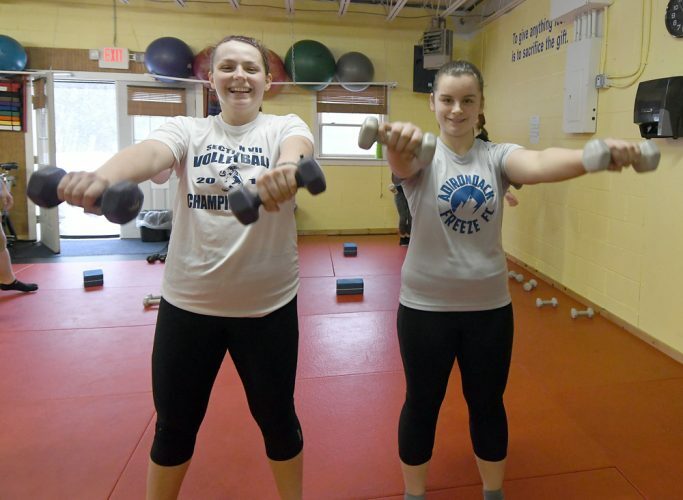 During their stay in the area, Newell and Jensen have both worked with the under-16 athletes, who hail from across the United States and have been staying at Paul Smith’s College. 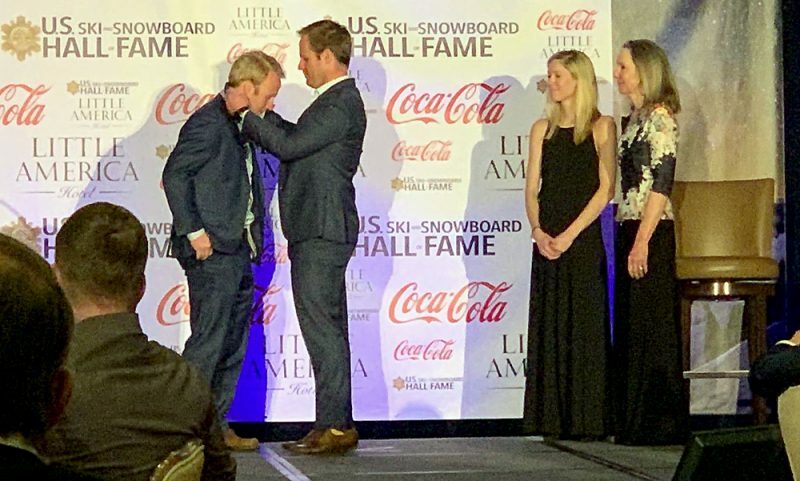 After a long competitive career internationally, Newell is focusing his efforts on more races state-side and helping younger athletes forward their Nordic careers. Like most Norwegian youngsters, Jensen grew up on Nordic skis and eventually discovered sprinting was more to his liking. And on Wednesday, he was happy to be wowing the spectators in Lake Placid. “It was a lot of fun racing Newell and the crowd was good, so a lot of fun,” Jensen said. “Growing up I did all distances in Norway. Cross country skiing is the most popular sport so every kid does it. And then there started popping up some super sprints around. I’m pretty fast and I’m a fast runner also, so I think I have talent for it. I just went with the flow. This week marked the first time Jensen has been to the Olympic Region. 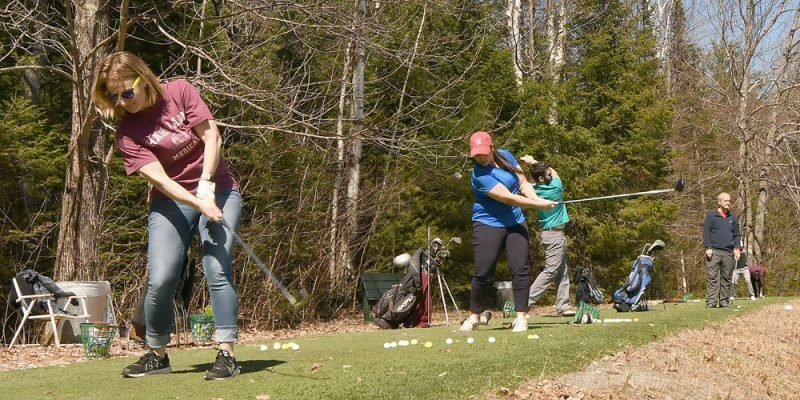 He’s enjoying a week-long trip to the U.S. that also included stops at a ski school in New Hampshire as well as visits to Burlington, Vermont and Boston. In addition to competing in Nordic sprints, the 26-year-old Jensen is also a college student in Oslo, Norway. After giving the agility course a try, participants in the under-16 camps also raced head-to-head on the 100-meter track, and on the girls side, Vermonter Quincy Massey-Bierman took top honors. Along with Jensen, Newell and under-16 camper Will Koch — the son of the legendary Olympic silver medalist Bill Koch — she stood on the medals podium after competitions wrapped up. “It’s been fun hanging out and skiing with skiers from all across the country that I would never be able to ski with,” she said. “It’s a nice training opportunity to ski with people from all over that are at a high level. I did get a chance to ski with some of them last winter at the junior nationals in Utah. In addition to watching the nordic athletes race on their roller skis, fans were also treated to aerials and ski jumping exhibitions. 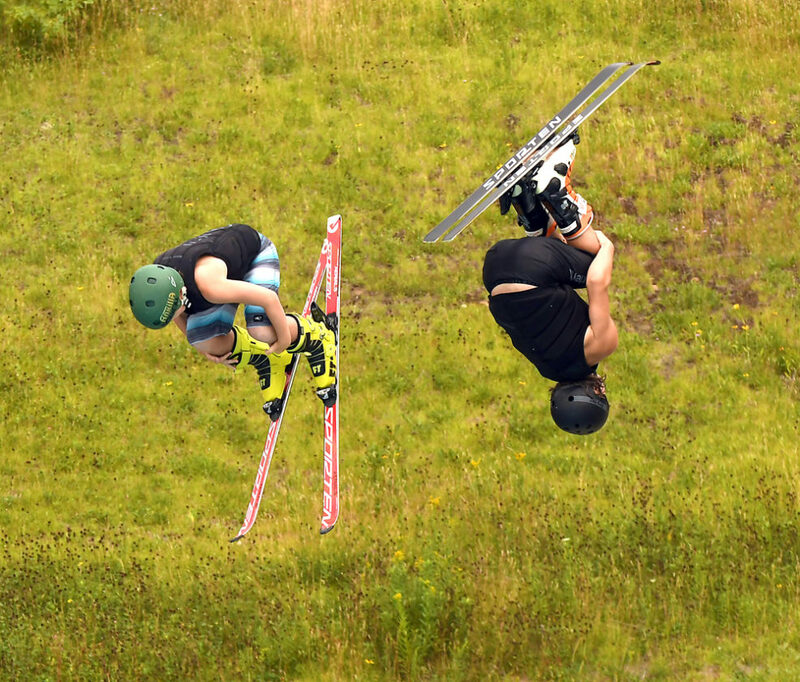 The afternoon’s activites kicked off with young freestyle skiers flying and flipping their way into the 750,000-gallon pool at the jumps and then moved into a handfull of young ski jumpers soring off the 90-meter tower.